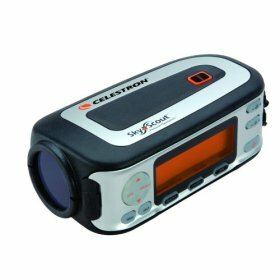 Designed exclusively for use with the Celestron SkyScout® Personal Planetarium® (sold separately), the new SkyScout® Scope 90 is easy to set-up, nearly maintenance free and features Celestrons precision optics. Simply attach the SkyScout® to the specially designed mount to locate and identify celestial objects. Once the SkyScout® has located or identified an object its time to take your celestial experience to the next level and use the SkyScout® Scope to reveal the wonders of the universe. Attaching and aligning the SkyScout Personal Planetarium is easy with the specially designed adjustable mount. No tools required. SkyScout Scope features a convenient pan handle with built-in clutch for easy targeting and smooth motion. 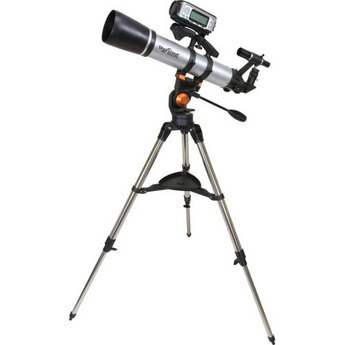 This style of mount is great for viewing nature and celestial objects. Erect image 6x30 finderscope with quick-release bracket. STAR DIAGONAL: Erect Image diagonal -1.25"
A fun learning tool for all ages, the SkyScout personal planetarium puts the knowledge of an expert astronomer in the palm of your hand. Constellation Lessons  If the user is looking at a star that`s part of a constellation, the SkyScout will inform the user, show a picture of the constellation, and help the user locate the other stars in the constellation. Updatable Software and Data  USB port included for periodic updates of the operating software, as well as the ability to download new data from celestial objects like the Space Shuttle or passing comets. SkyTour Content Cards  SD card slot exists for additional content offerings, such as Astronomy for Kids. SkyScout combines GPS technology, which gives the time, date and location of the user, software that calculates the position of the objects for that moment and 3 axis sensors measuring gravitational and magnetic fields to determine the true orientation of the SkyScout to the earth. 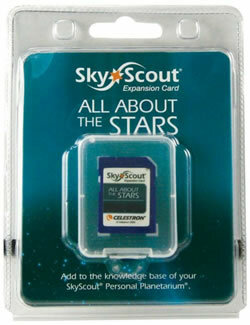 The All About the StarsExpansion Card adds to theknowledge base of yourSkyScout® Personal Planetarium®. Not only does it show you theobjects in the sky but now it can answer many of the mystifyingquestions about the Universe. What will happen to our Sunwhen it runs out of energy? Color of Stars - learn what secrets are revealed by a stars color. Luminosity and Magnitude - Tour stars that are hundreds of timesbrighter than our Sun. Stellar Evolution - Explore stars in every stage of their life cycle,from star forming regions to supernova. 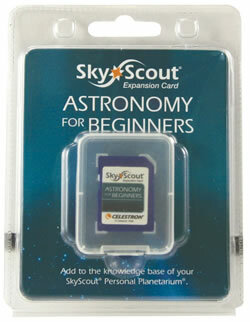 The Astronomy for Beginners Expansion Card adds to the knowledge base of your SkyScout® Personal Planetarium®. 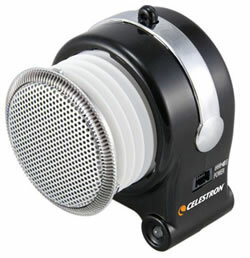 This high quality compact speaker features a rechargeable Lithium-Ion battery  charges from computer USB port. Extension cable  for flexible placement of speaker while using the SkyScout. Nylon Lanyard  to hang the speaker around your neck while using the SkyScout. Expandable woofer  for optimum sound quality The speakers have been thoroughly tested and guaranteed not to affect the SkyScout pointing accuracy.